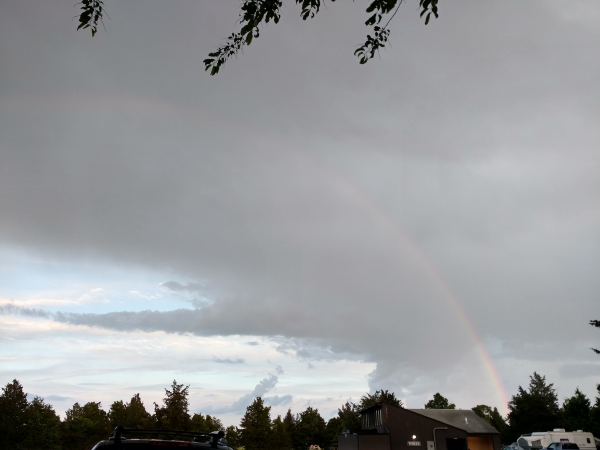 Our southern friends from Connecticut invited us to go camping at Hammonasset Beach State Park with them. They go every year as a big party, with family and friends. 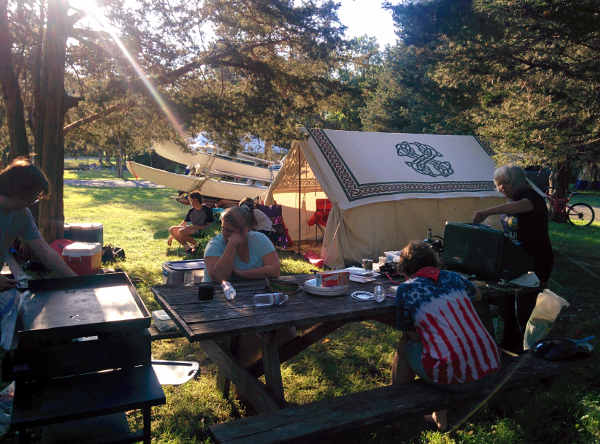 I only recently found out that this is a thing; our neighbors/friends from across the street go up to a campsite in New Hampshire every year to meet with other friends, some of whom they only know from camping. 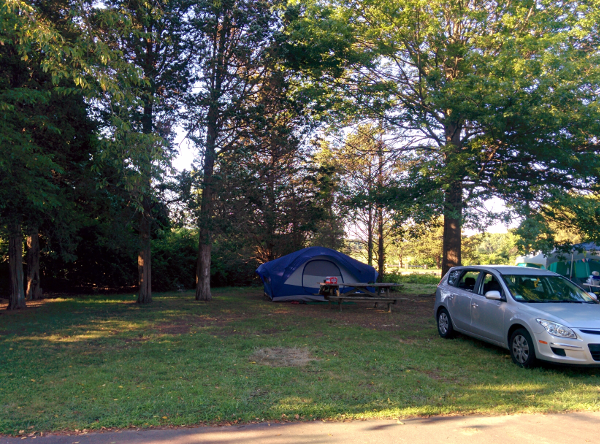 This was our first time going camping as a family, ever. I’ve gone deep-woods camping by myself. (No facilities, no roads, no people, no nothing — I’ve never smelled worse than three nights of that.) Meghan had been camping at Pennsic and Gulf Wars during college. (She has stories that amaze.) Beta has been overnight camping (in cabins) as part of Girl Scouts. We’ve all been “camping” in the backyard. This trip was a first for being away from home and trucking everything we would need. We arrived mid-afternoon and immediately set to pitching our tent, figuring that there could be nothing worse than setting up a tent in the dark when you’re exhausted. 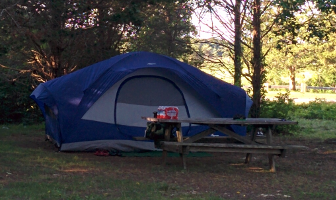 Though the tent was new and this was our first time, it went up pretty quickly and cleanly. Jones’s and Gaileys. The Gailey’s custom campaign tent is in the background; behind are a couple of Hobie Cats that we sailed the next day. Our friends provided dinner: our traditional Friday night get-together victuals, spaghetti with meat sauce and garlic bread, only on a Monday. Being experienced campers with a lot more room to pack stuff, they graciously offered to provide dinner for the two nights we were there. After dinner there were s’mores around a communal campfire, where we got to meet the rest of the party — more Gaileys and some family friends. There were kids of all ages, including a few that were right around Alpha and Beta’s ages. They played boffer swords until dark, then convinced a couple of us adults to play manhunt. We didn’t tuck into bed until about 10 pm. As the kids washed up some of us gathered around to chat and stargaze, and we were able to point out some satellites going by. The other adults hadn’t known that you could see them so easily. Schwing! Sleep, for a variety of reasons, was somewhat elusive the first night, except for Alpha who can sleep through pretty much anything. We started the day with pancakes, eggs, and bacon. The Gaileys possess a propane-fired flattop grill which made cooking a breeze. Sam wanted to get the two Hobie Cats they brought along into the water. We got to the beach and set to rigging them, then took ourselves and the kids out for some sails. We were at the beach for about four hours, and as a group we only got slightly burned — I had planned ahead and coaxed the girls into going to the beach with me for a week leading up to the trip. Meghan got a bit burned across the shoulders, and oddly enough Mu (the junior Gailey) got sunburned on the tops of his feet. After packing the boats back onto their trailer, we headed back to camp (with a detour into town to get aloe) in order to make dinner. Second night was a communal pot luck, with hot dogs, hamburgers, and a bunch of sides. We got to know the other campers in the party and found that we have a lot in common. 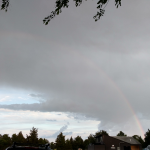 A passing shower gave us a rainbow… over the campsite bathrooms. We took the opportunity to coax the girls into bed a bit earlier, though sleep was still hard to find the second night. Besides possibly being over-tired, the temperature dropped to nearly 50° F so everyone (except me) was cold despite blankets. We all got up early to a beautiful morning. Meghan and Joanne took a walk back out to the beach to look for some bald eagles we had noticed the day before. Checkout is 12 pm, and we planned to swing through Noank on the way home to see the folks, so we packed up the campsite right after breakfast (more bacon, eggs, and pancakes, plus sausages) and hung out with the Gaileys until it was time to go. We bid adieu and headed out right at noon, spent a few hours having lunch and visiting with Mom and Dad Jones, plus Katie Jones and Eta (my niece). We made it home just in time to get Butter out of doggie daycare.